There are two systems in Sudan, the Arab written ‘Sharia’ banking and English written conventional banking. For a traveler there are only 2 conventional banks that I would advise, KCB and Equity. There are other Local and Ethiopian banks who have products tailored for local citizens, with Arabic characters on forms and Arabic language. This is the second oldest, largest and most established conventional bank with 3 branches in Juba. Don’t get fooled by the small disorderly city center branch, that branch is the best known of the ‘KCB’s as it was the first branch, while the modern Buluk branch is the headquarters and is about the biggest branch of any bank in town, with a large car park and huge banking hall. A new branch has just been opened in Malakia, the commercial center, and rock city branch. There are also several branches in other towns. It is owned by the Kenya Government and thus is very stable. It well known as the agent of Western Union money transfer. This is a Kenyan owned public bank following in the steps of K.C.B. It is attracting many new customers with lower charges and faster and easier service. 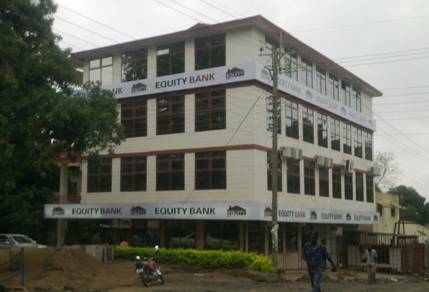 Currently they have a very large three storey branch in ‘Juba Town’ which houses the banking hall, corporate banking and the head office. There is a branch in Hai Malakal on the main road to Malakia. They also have an ATM money machine at the top of Tong Ping road behind the Ministries. They are planning to have a nation wide network. Equity boasts a very easy process for opening an account, you walk in with your passport, they take your photo, photo copy your passport and ‘voila’, you have an account, then three weeks later they call you for your ATM card.. They are in the process of opening more branches in other towns. Although large and inviting I was informed the bank was formed for handling Ethiopian government funds for development projects and is now in the process of converting to a normal bank focused on the public. The banking hall was on the first floor of their three storey building. This was the first and at that time the only Southern Sudanese bank, with a large network. Almost everyone banked there, before it collapsed, however there is a Government plan to revive it, as the revival is key to public confidence in the banking system. The Bank of South Sudan is the Government Central bank and does not take deposits from the public. They have a bright red building in Hai Cinema. They have not put the signs yet and are not open, even though the building was completed monts ago and there are staff. there are many rumors going around town as to why they do not open and start trading when they have invested so much. There are very many exchange bureaus, and a thriving black market in the street just outside the bureaus as well as at Customs bus park. Banks and Bureaus will give you the official rate of 3.5 while the black market may be 4 or more to the dollar, however there have been cases of fake currency notes and it not safe to change money in an open place so it is advised to only change your money in the bureaus or Hotels. All the bureaus are concentrated around the City Center, more than 20 on each street, so you do not have to look far for a bureau. Most Hotels will change your money at their reception or even at the bar, as the Hotels and their staff want dollars. The official exchange rate for Bureaus and Banks is based on the Government rate so there is no need to shop around when changing money. As the official exchange rates are fixed, many people change money in their hotel, so the Bureaus make themselves relevant and make profit by money transfer services. The bureaus can charge up to 5 percent for transfer, which is very high. (In Somali Land the same companies charge 2 percent) There were major profits made transferring money by Western Union (due to Sudan having two different exchange rates, North and South) and so Western Union have now severely reduced their operations although they were the cheapest at only 40 pounds per transfer. This is one of the biggest money transfer company in the world, based in Somali land and USA. It is fast and reliable with many branches all over the world, Dollar to Dollar. Their main feature is they call the recipient when the money arrives. They are agents of the second largest Somali transfer company, Amal Express. They also have a large international network and are fast and reliable. Location, Juba town inside Kenya Commercial Bank building. They are agents of a large international transfer company thus have a large international network and are fast and reliable. They are agents of Western Union money transfer company. They were the only company offering ‘M-PESA’, Direct transfer of cash to a mobile phone in Kenya. They are located above the ‘K.C.B’ in Juba town. They also had telegraphic transfers. They were shut down by the authorities so the MPESA business moved to Shambe, a sister company. Are located in the taxi park, Juba town. They are now the only place offering MPESA services, direct money transfer to a Mobile phone in Kenya. There are also many in Malakia, and now in Jebel Market and other parts of town. Given the forex rate differentials forex is the most profitable business in town. They get a dollar for 3.5 and sell it a few minutes later at 4. A new forex bureau opens every day, I can not keep track any more. The forex bureaus never have dollars for sale, (officially) which is strange given that they are constantly buying dollars!! . The Government has now started to clamp down on Bureaus that are not complying with their regulations and a few have been temporarily closed. This will not affect you as five open for each one they close, often with the same owners and staff..